Interested in React but find yourself confused about how to use it with the Flux architecture? This is your book. Authors Alex Banks and Eve Porcello show you how to build React applications with the entire React ecosystem—including Flux. 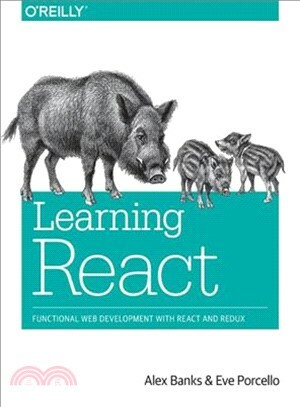 You’ll learn about the methodologies behind the creation of the library and its related tools through short interviews with key players in the React community. Alex Banks and Eve Porcello are experienced software engineers, corporate trainers, and Lynda.com authors. Alex Banks is a software engineer, instructor, and cofounder of Moon Highway, a curriculum development company in Northern California. As a software consultant, he has developed applications for the Chicago Marathon, MSN, and the Department of Energy. Alex also assisted in the development of the continuous delivery curriculum that is delivered to every Yahoo new hire. In addition, he's authored several classes for Lynda.com. Eve Porcello is a software architect and cofounder of Moon Highway, a curriculum development company in Northern California. Prior to Moon Highway, Eve worked on software projects for 1-800-Dentist and Microsoft. She is an active corporate trainer, speaker, and author on Lynda.com.